We have come to Seattle in open revolt. The Committee for Full Enjoyment is a loosely-knit group of radicals who oppose the governance of human life by the abstraction known as The Economy. All human concerns are subordinated to the dictatorship of money. Real work�childcare, health care, education�is starved for support and pays modestly at best. Meanwhile, useless work like investment banking and real estate speculation are rewarded handsomely, and corporate executives �earn� 47 times as much as the workers on whose back they are profiting. It doesn�t take a genius to see that something is seriously wrong with this picture. But we aren�t here just to pound the drums of negation (even while our voices join thousands of others in a resounding NO! to the World Trade Organization, a.k.a. Wealthy Take Over). The object of human life is not an evenly balanced list of exchanges, nor is it to gain advantage at others� expense. The object of life is the full expression of our humanity, the passionate, ecstatic and even routine connection with others, and the creation of a good life for all. The WTO faces us with the formal demise of local sovereignty�local and national governments must now submit to the decisions of unelected barbarians, guardians of the bureaucratic logic of world capitalism. Laws enacted to protect workers from excessive exploitation, or the environment from excessive depradation, are now classified as impediments to free markets. Tariffs on products from countries who depend on near-slave labor or unrestrained pollution to �bring cheap products to market� are going to be nullified by WTO gnomes representing the general interests of capital against any other system of values, human or ecological. The WTO is the new enforcer of a logic under which we�ve all already been largely subsumed: The Market Rules. Period. Nothing must infringe on market logic, because according to these barbarians, the �health� of markets is the health of human society. The propagandists of the American Way of Life have spent many decades trying to convince us that our well-being depends on the health of the Economy. The complex web of human activity that creates the material world is reduced to a series of abstractions, usually called �markets.� If the bizarre numbers associated with measuring markets are going up, or growing, then by definition life is getting better. When the numbers game collapses, as it always does sooner or later, a depression comes like an act of nature, a catastrophic storm, which we are supposed to endure while markets �correct� themselves and the storm passes. 2.) It hides the actual planning and social designs imposed by a wealthy elite with the basic purpose of maintaining their power. In this upside-down world, we get extensive news coverage of weather events, �natural� disasters resulting from the willfully ignorant expansion of human society over flood plains, fault zones, and low-lying coastal areas. But the role of human choice and action is removed from our framing of these events. Meanwhile, the area of human life in which we have the most decision-making power�our work (what we do, how, and to what purpose)�is not treated as news at all. It appears as �natural� in the incessant drone that accompanies the ebb and flow of commodity and stock prices, real estate values and absurd gauges like �Gross National Product.� Our �choice� to get up and go to a given job every day is something few of us experience or actively engage with on a daily basis. Questions regarding our personal happiness, our sense of purpose in our work, its relationship to human well-being, its relationship to local ecological sanity�all are treated as problems of personal psychology and not as matters of public, shared concern. We have no responsibility for the consequences of our work. Our purpose is not the activity or its results, but to get money to pay our bills. By this insane arrangement it�s possible to work in an office or factory that spews poison into local waterways and feel no responsibility for that �side-effect,� because in fact we are separated from responsibility by the relationship of wage-labor. We sell ourselves and do as we�re told; if we don�t, we usually lose our jobs. Whistle-blowers are rare and even more rarely rewarded. The notion that perhaps all the people who work together should evaluate the nature of their work, how it is organized, what its mission is and how that relates to larger questions of social and human well-being, how it uses resources and produces waste, what impacts it has on local ecology, and so on, is simply crazy in a market economy. The monetary relationships that falsely define our connections to each other as employees, employers, or investors, preclude a self-responsible, self-directed engagement with the deeper questions of our lives. The social and spiritual emptiness that afflicts nearly everyone in America is no accident. It is the logical outcome of the organization of our lives by The Economy, a world in which the barbaric practice of buying and selling human time is accepted as the way life must be. This so stunts our collective imagination that we willingly exchange our humanity and our lives as social beings for the pathetic and extremely partial compensation of a wage. Then we�re supposed to make up for the mess we�ve made at work by shopping for the goods that are the least awful, and perhaps by volunteering in our (increasingly limited) �free� time to campaign against this or that excess. 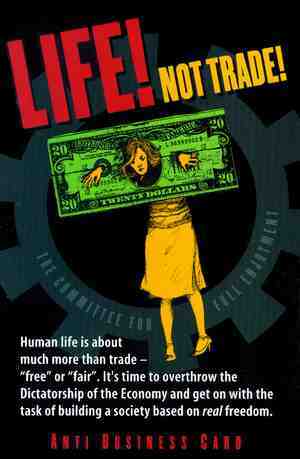 The World Trade Organization is the culmination of a centuries-long process in which human societies and their commonly-held land and productive wealth have been torn apart, leaving the vast majority with �no choice� but to sell their labor to the wealthy few who have stolen the commons and made it their private property. In selling our labor we submit our own good sense, creativity and productive capacities to an agenda not our own, over which we have no control. The owners say, �if you don�t want to do this work�don�t! I�ll hire someone else.� But they control society�s material resources and the kinds of activities towards which social wealth will be directed. They also have control of basic scientific research and its application as technology. Most of us as atomized individuals are prevented from having a say over what work gets done, what products are made and to what standards, how work is structured, and how the fruits of our labor are shared. The notion that we can �vote with our feet� by choosing a different job, and that that gives us any real control over the basic choices in this life, is a sick joke. Alternativists have created workers� co-ops and brought new products to market (e.g. organic produce) again and again, only to see their efforts squashed or absorbed by the larger logic of the market economy. Even the richest, most powerful businessmen feel powerless in a system that forces everyone to conform to the dictatorship of growth, of accumulation and concentration of power and wealth. Most of us here in the streets already know that we are living in one of the most barbaric periods ever. Client military regimes slaughter their citizens with impunity. Civil wars are fueled by multinational companies seeking greater concessions and more access to oil and minerals. The sharp class divisions in supposedly wealthy countries like the U.S. are producing more and more desperately poor people, who in turn keep the working �middle� class toiling harder and harder through the greatest speed-up in human history. At this millenial turn, life for most on this planet is harder and more brutish than ever. Even for those of us who could claim to be relatively comfortable materially, our lives are both busier and emptier, more stressful, less fun, with less community and less good living than we were enjoying twenty years ago. When was the last time you just dropped in on a friend to share a cup of tea and a meandering conversation? Even children are living lives of frantic busy-ness, school and homework, after school sports and music lessons, daycare. Kids hardly even have time to play! We are all so busy keeping up that few can step out of the hamster wheel long enough to notice how much we�ve lost (or in many cases, never had). We are in the streets of Seattle in the spirit of a real alternative, maybe we should call it the Global Association of Gift-Givers (GAGG). We believe there is enough to go around. We believe that life�all life�is precious, and the passion for life is the same passion that makes us artists, that convinces that together we can make life what we want it to be. In the streets we have recreated the public commons, at least temporarily. We reject trade, free or fair, for trade reinforces the pecuniary mentality that reduces human life to the arbitrary measurement of its products, to the Economy. As free people we can live better, work less (and enjoy the pleasure of the work we deem worthwhile) and provide an unprecedented level of material comfort to everyone on the planet. Scarcity is the main product of the World Market. A phenomenally rich world full of extraordinarily talented, creative people can make a life of abundance for all. The Economy stands in our way, physically and mentally. When we abolish the Economy, we will see the world with new eyes, new energy, new possibilities. We make the world everyday when we return to work for them. Why not make the world we want to live in instead? Won�t you join us?